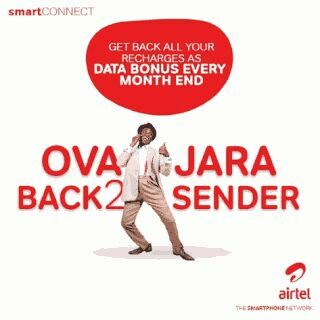 It's quite noticed that Airtel Nigeria has the most enticing charges and affordable data plans compare to other networks, and just recently they introduced a new ovajara x8 times offer which is smartCONNECT 4.0- OvaJara Back2Sender, this package is a more added features of the former Airtel's SmartConnect 2.0 and guess what? You are really going to like it. See how to activate it here. Airtel Back2Sender offers you 8 Times bonuses while SmartConnect 2.0 gives you 6x data bonuses. Meanwhile, this bonus can be used for Free Browsing without any Internet Tricks/tweak. With the Airtel ovajara Back2Sender 8x you can get 8 times value of your recharge whenever you top up! You would be rewarded with 100% amount of your recharge as added data bonuses plus the eight times bonuses you receive on every recharge you made. This packages are mainly designed to improve Airtel's new customers' experience and make it more easier for consumers to browse, call and do more on the network without much stress. According to Airtel Nigeria, once a customer buys a replacement SIM, registers and inserts it in a very device, he/she begins to get pleasure from the Ovajara eight times (smartCONNECT) bonus and additionally gets the full worth of his recharge as data bonus by finish of every 2 months. It seems Airtel are using this method to induce additional subscribers to the Airtel network but anyway, its a really good idea though. When a you recharges with N200, you would be rewarded with N200 in your main account and receives a bonus of N500 for voice calls and N500 data bonus, with an extra N200 airtime to call your family & friends or loved ones with an additional bonus of N200 for social medias - BBM, Twitter, Facebook, WhatsApp and whole of them, that makes a complete of N1600 airtime on each N200 recharge. is this not enticing? Getting the Airtel's ovajara x8 free bonus doesn't requires any trick, just get a new Airtel sim card and recharge with N200 by dialing *126*Card PIN# and start enjoying! To check ovajara x8 balance, dial *123#. Nice post Check out the new settings here . I so much like it bcoz this 9Mobile free browsing cheat with Anonytun VPN is the same as Etisalat's 0.0KB tweak.